Charles Leonard Hardware was included in "Landmarks of Hardware History" Hardware Dealers' Magazine, 1 April 1912, pg. 779, as founded in 1845. This ad for Charles Leonard City Gun, Rifle & Pistol Manufacturing and Importing Warehouse from an 1855 gazetteer located the business at 15 Old St., Petersburg, at that time. By the time of the Chataigne & Boyd Petersburg Directory of 1872-73 they had relocated to 13 Bank St., and in Chataigne's Petersburg Directory of 1888-89 they had moved across the street to 14-16 Bank St. The business was incorporated at this address in 1908. This ad for Chas Leonard Hardware appeared in the 1911-12 Petersburg city directory. It wasn't until the 1915-16 directory that they were listed at 20-24 Bank St. This remained their location until going out of business sometime after 1960. This ad for Charles Leonard at 11, 13 and 19 Bank Street appeared in Historical and Industrial Guide to Petersburg, Virginia, by Edward Pollock, 1884. The founder was an immigrant from England, Charles Leonard (1826-1916). Virginia death records say that he died 16 July 1916, age 89 years, 6 months and 17 days, and that he was born in London, England, 29 December 1826. Charles Leonard is buried in Blandford Cemetery, Petersburg, and his mausoleum can be seen on www.findagrave.com. On Charles Leonard's death, president of the company became Charles Cunningham Brown (1859-1927). Brown's tenure, however, was short. In 1921 Hardware Dealers' Magazine, 1 Oct. 1921, pg. 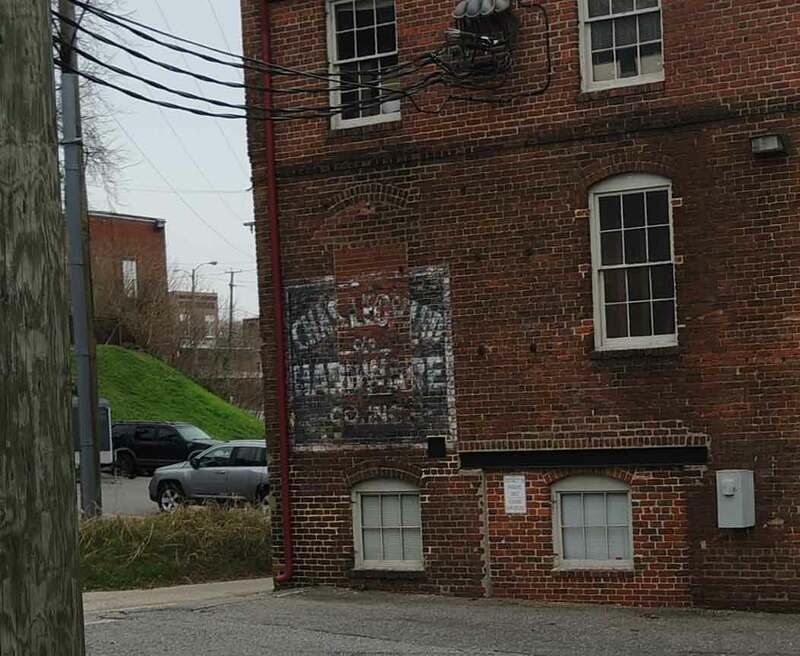 690, announced, "The control of the Charles Leonard Hardware Co., one of the largest mercantile houses in Petersburg, Va., and one of the largest wholesale houses in the state, changed hands at a meeting of the stockholders recently. Frank M. Hobbs and his associates acquired control, Mr. Hobbs succeeding C. C. Brown as president. The new owners have taken charge and no radical change in either the conduct of the business or the personnel is contemplated. The store is celebrating its seventy-sixth birthday. Besides being president of the new company, Mr. Hobbs is general manager. J. R. Burgess is first vice-president and assistant manager; J. A. H. Newsome, second vice-president; W. A. Bond, secretary and treasurer; and E. O. Talmadge, assistant secretary and treasurer and sales manager. The board of directors is composed of the following: W. A Bond, J. R. Burgess, F. M. Hobbs, C. Howard Kinsey, W. W. Minetree, J. A. Newsome, L. P. Robertson and J. W. Smith." The new president in 1921 was Frank May Hobbs (1870-1946). Frank M. Hobbs was identified as a clerk at Charles Leonard Hardware as early as 1897. He was president of the company from 1921 until his death in 1946. Virginia death records say that he died 11 December 1946, age 76 years, 3 months and 12 days, and that he was born in Petersburg, Virginia, 29 August 1870. The following brief notice appeared in the Washington Post, 12 December 1946, pg. 4, "Frank May Hobbs, 76, president of the Charles Leonard Hardware Co. here [Petersburg, Va.], died today in Richmond hospital. Funeral arrangements have not been completed. Hobbs had been associated with the firm he headed since he was 17 years of age. He was a son of the late Robert F. and Gabriella Hobbs. He was a member of the Petersburg Rotary Club and of Washington Street Methodist Church. Surving is his widow, the fomer Miss Annie Louise Twittie, of Petersburg." Another figure at Leonard Hardware was Richard Milton Cary (1886-1970). R. Milton Cary was assistant secretary-treasurer in 1917. Much later (1940s) he became an auditor with the City of Petersburg. He died 30 August 1970, age 84, when his occupation was Retired, Petersburg City Auditor. In the 1910 U. S. Census Lucius Peebles Robertson (1861-1942) was a travelling salesman, wholesale hardware. Lucius P. Robertson was secretary at Leonard Hardware from 1929 until 1941. He died 23 September 1942. Virginia death records record his birth as 2 March 1861, Petersburg, Virginia, and his occupation as "Retired Wholesale Dealer Chas. Leonard Hardware Co."
Charles Leonard Hardware often dealt with products not usually associated with a hardware store, items such as sporting goods (guns? ), toys and accessories for automobiles. This ad from 1937 mentions the sporting goods and auto accessories.